Ysa�e�s works for violin and orchestra are far less frequently encountered than his solo sonatas. There was always something of a vogue in Russia for some of the bigger works. Oistrakh was a proponent of the Po�me �l�giaque, recording it. More recently Raskin has committed a couple to disc. But in the main these are under-recorded works of lush, Chausson-esque evocation. One can see what Oistrakh saw in the Po�me �l�giaque. Along with its hothouse Franckian inheritance there�s Chausson�s stamp but also a Tchaikovskian shape to the solo line that reminds one of the Russian�s own Violin Concerto. 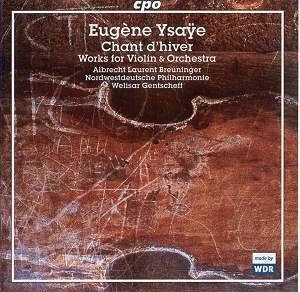 The languorous heat haze that sometimes falls over the music is almost tropical - the rich orchestration is by Jacques Ysa�e. Chant d�hiver offers another cushioned ride, though one obviously less verdant. Good player though he is � lower string work really speaks - Albrecht Laurent Breuninger takes a decidedly more leisurely approach than Aaron Rosand did in his traversal with the Luxembourg Radio Orchestra and Louis de Froment in their Vox Box. Rosand deploys timbral variety and a bewitching colouration to make this piece really live and at a considerably faster tempo. The newcomer�s more leisurely charms aren�t obliterated but are very different. The Berceuse is a more concise and delightfully lyrical morceau but of a bigger stamp is Les neiges d�antan. This has its whimsical side, attractively brought out here, and certainly not over-done. Breuninger dares a sleek period portamento or two and he proves deft in his harmonics, even the cruelly stratospheric ones with which the piece ends. The Violin Concerto might raise hopes as to an undiscovered masterpiece but it�s actually a surviving work � among many concertos � from his relative youth and boyhood. It�s couched in concerto grosso form, in three movements, and is for strings alone. The recording team has calculated this rather well with the solo violin well integrated into the body of strings without losing its relative prominence in the fabric. The ethos here is backward-looking but enjoyable because there are those typically languorous moments that mark out his orchestral writing. The fugato sounds rather academic but the slow movement is intense if short. The finale has its vaporous moments but also some Chausson inspirations as well. The Op.24 Divertimento is aptly described in the notes as an example of Art Nouveau in music. Well, Brussels is famous for its Art Nouveau, and Ysa�e was a Belgian, so ... well let�s not follow it too far as Li�ge was his stomping ground. There are some insider�s bowing demands here and some terrific colouristic opportunities. It�s an unusual work, quite intense, with a lot of decorative embellishment of the theme. This disc has the field largely to itself at the moment. Performances are warm and lyric, though occasionally rather laid-back. With very decent notes and a suitably enveloping acoustic this is a intriguing sidelight on Ysa�e�s more prominent and bracingly up-to-date solo sonatas.